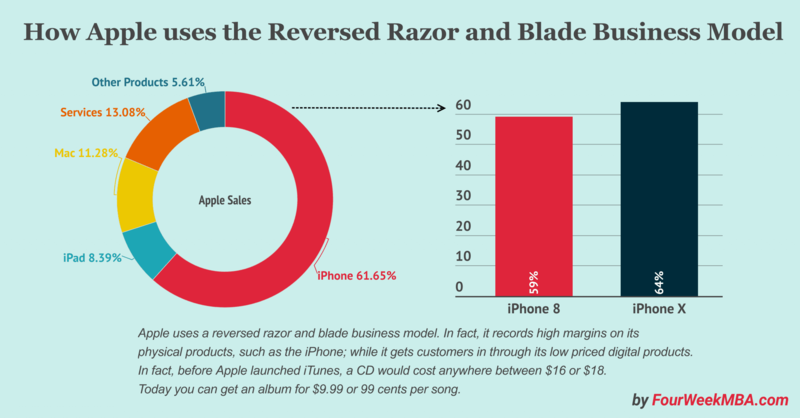 The razor and blade business model is a strategy that relies on selling what is supposed to be the primary product at a low price or given away for free; while complementary goods get sold at high margins. For instance, Gillette’s razor would cost a few bucks. Instead, a set of blades will be 3-4 times more expensive. At times company that seems to follow the razor and blade business model in reality use a variation of the same. In fact, take Apple, which has been a disruptor of a few industries. The company today uses a version of the razor and blade business model: the reversed razor and blade business model. In short, In this case, the iPhone is the blade. What is the razor then? That is the iTunes or the set of digital products Apple made available through its store. In fact, when Apple launched iTunes, a CD would cost anywhere between $16 or $18. Today you can get an album for $9.99 or 99 cents per song. Thomas Hesse: President, Corporate Development and New Businesses, Chief Digital Officer at Bertelsmann. He was Chief Strategy Officer for BMG Music Entertainment when the iTunes Music Store launched.